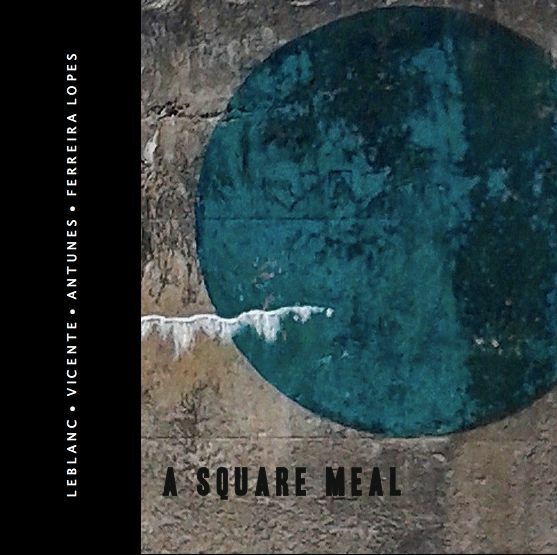 Karoline Leblanc, the Montreal player who we last heard with 2016’s Velvet Oddities, is here with A Square Meal (atrito-afeito 007) on her own label which she runs with Paulo J Ferreira Lopes. This a quartet recording of some free jazz / improv pieces, and the players are Luis Vicente, a Portuguese trumpet player who had a few releases on FMR Records; Hugo Antunes, the Portuguese double bassist; and Paulo J Ferreira Lopes, the drummer who has played with Leblanc before and made a solo record (Feeze) for this label in 2013 using drums and electronics. These 2016 recordings are mostly high-energy free jazz workouts, where Leblanc does everything in her power to imitate Cecil Taylor with his insane keyboard runs – just check her out on ‘Mind and Intent’, especially the opening roaring passages. However, the three other players can’t match her for speed, accuracy, or listenability. The trumpeter is particularly useless, with a very limited range, an annoying sound (his use of the wah-wah mute is most unfortunate), and no clear idea of what he’s trying to do. I don’t deny he has a range of surface tricks at his disposal, but I doubt if they really qualify as “extended technique”, and they are not doing anything to serve the music – just gratify his own needs. The drummer appears to be lost, and can’t keep up with the frenetic pace; too often he just falls back on marking time with some hesitant pattering on the cymbals. I think we need to hear more work from the toms and bass drum, to give more foundation and solidity to this music which is often in danger of just flying away like tissue paper in the wind. Lopes should be punctuating the music better, setting some limits, not just agreeing complaisantly with the soloists as they indulge their tastes for flabby blasts. Only the bassist Antunes is adding flashes of playing that contribute something of value, be it a jagged note that supports a moment of sparseness (sadly rare, in this largely full-on blowing mode they have elected to work with) or some abstract scraping sounds that have some roughage and are slightly less conventional than the rest of this predictable noise. In all, this “square meal” has been largely unappetising, and a rather unnecessary release. From 28th March 2017.